A dozen finance types dead in the last few months,are these random events,or is there something sinister going on? Is a cluster of suicides,and "accidents" in a particular field unusual,or just eerie coincidence? 1 - William Broeksmit, 58-year-old former senior executive at Deutsche Bank AG, was found dead in his home after an apparent suicide in South Kensington in central London, on January 26th. 2 - Karl Slym, 51 year old Tata Motors managing director Karl Slym, was found dead on the fourth floor of the Shangri-La hotel in Bangkok on January 27th. 3 - Gabriel Magee, a 39-year-old JP Morgan employee, died after falling from the roof of the JP Morgan European headquarters in London on January 27th. 4 - Mike Dueker, 50-year-old chief economist of a US investment bank was found dead close to the Tacoma Narrows Bridge in Washington State. 5 - Richard Talley, the 57 year old founder of American Title Services in Centennial, Colorado, was found dead earlier this month after apparently shooting himself with a nail gun. 6 - Tim Dickenson, a U.K.-based communications director at Swiss Re AG, also died last month, however the circumstances surrounding his death are still unknown. 7 - Ryan Henry Crane, a 37 year old executive at JP Morgan died in an alleged suicide just a few weeks ago. No details have been released about his death aside from this small obituary announcement at the Stamford Daily Voice. 8 - Li Junjie, 33-year-old banker in Hong Kong jumped from the JP Morgan HQ in Hong Kong this week. 11 - Kenneth Bellando, 28, a trader at Levy Capital, formerly investment banking analyst at JPMorgan, jumped to his death from his 6th floor East Side apartment. 12 - Jan Peter Schmittmann, 57, the former CEO of Dutch bank ABN Amro found dead at home near Amsterdam with wife and daughter. Re: A dozen finance types dead in the last few months,are these random events,or is there something sinister going on? This proves it again that it's a high risk - high reward occupation. Yep, seems like "the Group" was sending the underlings a message when you can't "Corzine" enough of your clients phyz Gold to cover withdraws. Notice they sent the Wolf to not only take out the banker, but his family too, leaving just one to tell the tale perhaps .... So, the rest of you fuckers better do whatever it takes to keep the Gold Ponzi balls in the air... Whatever it takes,or your wife and kids get it too ... Think that message is getting through ? only a banker can get the possible family tragedy. Wall Street Journal only get a possible missing tragedy. Has anyone checked to see if the market goes up when one of these guys gets whacked? You forgot: Joe Contrarian found brain dead at an Ottawa ATM machine . . . The 48-year-old man was shot in the underground garage of a financial institution in Balzers at 7:30 a.m. local time, the Liechtenstein police said on their website today. Neither the victim nor the institution was identified in the statement. The deceased was Juergen Frick, CEO of Bank Frick & Co. AG, according to Switzerland?s Radio 1, which cited employees of his bank. The only problem with this theory is that while some bankers have died recently, there's like tens of thousands of them around the globe. The death rate isn't anything out of the norm. The 3rd largest holder of U.S. Treasury debt currently is? In the beginning it was banker suicides. Then about two weeks ago, suicides were replaced by outright murders after the execution-style killing of the CEO of a bank in otherwise sleepy (and tax evasive) Lichtenstein by a disgruntled client. Then on Friday[4/18/2014] news hit of another execution-type murder in just as sleepy, if not so tax evasive, Belgium, where in the city of Vise, a 37-year-old Director at BNP Paribas Fortis was murdered alongside his wife and a 9 year old nephew in a premeditated and orchestrated drive-by shooting. There have been 13 senior financial services executives deaths around the world this year, but the most notable thing about the sad suicide of the 14th, a 52-year-old banker at France's Bred-Banque-Populaire, is she is the first female. As Le Parisien reports, Lydia (no surname given) jumped from the bank's Paris headquarter's 14th floor shortly before 10am. FranceTV added that sources said "she questioned her superiors before jumping out the window," but the bank denies it noting that she had been in therapy for several years. perspective on this. Meanwhile 22 vets a day are committing suicide. Thierry Leyne, a French-Israeli banker and partner of Dominique Strauss-Kahn, the disgraced former chief of the International Monetary Fund, was found dead on Thursday 10/23/2014 after apparently taking his own life in Tel Aviv. Mr. Leyne, 48, jumped off the 23rd floor of one of the Yoo towers, a prestigious residential complex, according to Israeli officials. A senior Deutsche Bank regulatory lawyer has been found dead in New York after committing suicide, New York City officials said on Saturday. Calogero Gambino, 41, was found on the morning of Oct. 20,2014 at his home in the New York borough of Brooklyn and pronounced dead on the scene, according to New York City police. He had been closely involved in negotiating legal issues for Deutsche Bank such as a probe by regulators of banks over allegations they manipulated the Libor benchmark interest rate as well as currency markets. He died by hanging, said Julie Bolcer, spokeswoman for the New York City Office of Chief Medical Examiner. The manner of death was suicide. A British man has been charged with the murder of two women who were found naked inside his luxury Hong Kong apartment. The reported crime scene recalled Bret Easton Ellis' book "American Psycho" where numerous barbaric crimes occur in the apartment of a Wall Street investment banker. Mr Jutting studied at Winchester College, an independent boys school in Hampshire, before continuing his studies at Cambridge University where he became secretary of the history society. work for Bank of America Merrill Lynch. The company seconded him to Hong Kong in the summer of 2013. His last known address in the UK was in Wapping. One co-worker at the Bank of America Merrill Lynch in Hong Kong, who declined to be named, described Mr Jutting as someone who "talked very loud and made ---- loads of money". The dust has barely settled on the latest high profile banker suicide in which Deutsche Bank's associate general counsel, and former SEC regulator, Charlie Gambino was found dead, having hung himself by the neck from a stairway banister, and here comes the latest sad entrant in the dead banker chronicles of 2014 when earlier today, the Post reports, a Citigroup banker was found dead with his throat slashed in the bathtub "of his swanky downtown apartment, authorities said Wednesday." Shawn D. Miller, Citigroup?s managing director of environmental and social risk management, was discovered around 3 p.m. Tuesday by a doorman in the Greenwich Street building, law enforcement sources said. ?We are deeply saddened by this news and our thoughts are with Shawn?s family at this time,? said a statement sent out by Citigroup. Bloomberg adds that "a 42-year-old man was found unconscious yesterday in the bathtub of his Greenwich Street apartment in lower Manhattan with a neck laceration and later pronounced dead, the New York Police Department said in a statement." The Mid-level guys are the brains of the operation, the meat in the hamburger. Indeed they are. It's seems likely he was eliminated to silence him, but another (admitedly slim) possibility, is key mid-tiers are being targeted to "encourage" others to talk. For such a strategy to work, you dont go after generals (they're too well protected), and you dont go after the grunts (they dont know enough and there are far too many of them). If you want to cripple an organization, you go after the captains, majors, and colonels. As I say, it's a long shot, but it's not a zero probability item either. Worse case of suicide I have ever seen!!Lol!! A financier at the heart of one of Britain's biggest divorce battles has died after falling from his ?3 million home and impaling himself on iron railings. Scot Young, 52, suffered horrific injuries after plummeting four storeys from a window of his luxury central London penthouse. His death comes almost a year after an extraordinary legal fight with his ex-wife concluded at the High Court. Michelle Young, 49, won a ?20 million payout after a seven-year legal battle but declared the sum a "disgrace" and is never believed to have received the cash. She said she thought Mr Young was worth "billions" and claimed that he had hidden his fortune. The most bizarre story from the past weekend was the shocking murder of Tom Gilbert, 70, founder of the Wainscott biotech-focused hedge fund, who was shot dead in his Sutton Place apartment on Sunday Afternoon: shocking because the alleged shooter was none other than his Millennial, hence unemployed, 30-year-old son. What was certainly unclear at the time was what would be the motivation of a son to kill his successful and wealthy father, especially in such dramatic cold blood. A law enforcement source told the New York Post that Thomas Gilbert Jr. had just been told by his father that he would only receive $400 for spending money per month from that point on in addition to $2,400 per month for rent. The younger Gilbert had previously received $600 per month. The Ivy Leaguer was a mainstay at New York society black-tie events in recent years but one ex-girlfriend revealed details of his dark side on Monday. 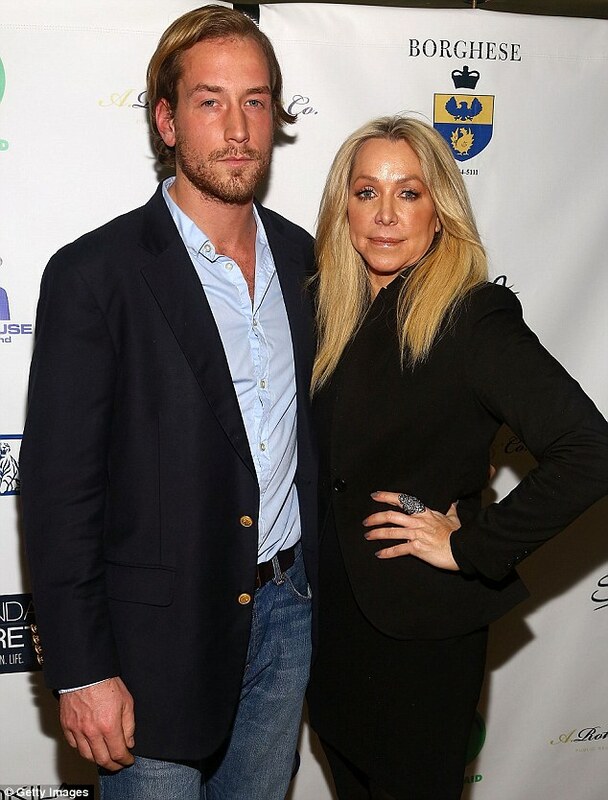 Manhattan socialite Anna Rothschild, 49, whom he dated last year, said Tommy was a loner with few friends who deeply resented his father and was obsessed with how he would 'never be good enough' for his dad. Gilbert Jr.'s ex girlfriend - twice-divorced Upper East Side socialite Anna Rothschild - told the Post that her former flame was a loner who had few friends and never got phone calls. The only person who ever called him was his mother, Miss Rothschild says. 'How could a guy be that gorgeous,that wealthy,and kill his dad? This is the last thing in a million years that I thought he could do,' Miss Rothschild, 49, told the Post. His one professional aspiration was founding his own hedge fund - but he complained that his father wouldn't give him the seed money to start it, Miss Rothschild said. Gilbert Jr. has an investment company registered to his $2,400-a-month Chelsea apartment - though it's not clear the firm has any assets under investment. The company is a called Mameluke Capital - mamelukes being 13th-century Muslim slave soldiers. An investment banker who jumped out the window of his luxury lower Manhattan high-rise apartment was behind on his rent, took drugs and struggled with work stress, according to his family and police sources. Thomas Hughes, 29, had swallowed a fistful of pills and sat on the ledge of his 24th-floor luxury apartment at 1 West St. for several minutes before leaping off it and plunging 200 feet to his death Thursday morning, police sources said. Drugs were also found in his apartment, the sources said. No note was found. Hughes had been under ?a lot of pressure? and may have turned to drugs, his father told Daily Mail Online. ?Thomas was a happy, jovial, successful, good looking, very sociable individual,? John Hughes, who lives in Briarcliff Manor in Westchester County, told the paper. When you work for Goldman Sachs you are dancing with the devil. The authorities have said they believe Sarvshreshth Gupta, 22, killed himself after working through the night and struggling to match the demands he felt under. The graduate of the University of Pennsylvania who was born in New Delhi, told his father, Sunil: ?This job is not for me. Too much work and too little time.? Mr Gupta wrote about his son?s death in an essay posted on Medium, which has since been removed. ?He calls us and says, ?It is too much. I have not slept for two days, have a client meeting tomorrow morning, have to complete a presentation, my VP is annoyed and I am working alone in my office?, ? his father wrote. He added: ?I got furious. ?Take 15 days leave and come home,? I said. He quipped, ?They will not allow.? I said, ?Tell them to consider this as your resignation letter.? ? The New York Times said Ms Gupta?s death in April is one of numerous unexpected deaths or suicides of young bankers over the last year. It said it had sparked a round of reflection by Goldman Sachs and other Wall Street firms about their work policies. I'm not saying you are right or wrong about all of this. But by reading some of these articles on the deaths, these people led a highly-stressful lifestyle that included long hours with little sleep. Drugs were involved in some cases. Now you are including articles on a 22-year-old entry level worker. I don't see any signs of conspiracy yet. Agree,it seemed like a conspiracy-and some of these could be hits-,but its morphed into a thread on the nature of business,and the pressures that workers have to go through. Well, tell me what you think is going on? I'm not going to discount what you say, however, I may look into it myself. In early November, Mikhail Lesin - a close ally of Putin and the man credited with inspiring the creation of Russia Today - was found dead on an upper floor in The Dupont Circle hotel. The death was said to be the result of a heart attack. We were skeptical, and for a reason: according to the office of the Chief Medical Examiner, Lesin's death was the result of “blunt force injuries of the head.” In other words, he was murdered. what awful news! http://bigpaperwriter.com/blog/day-of-the-dead-essay sumbimts information about the day of the dead! A prominent 47-year-old hedge fund trader was killed when he jumped from a luxury apartment building on Manhattan's Upper West Side, in an apparent suicide, authorities told the NY Post. Dive from the fourteenth floor"
A 56-year-old partner at Paulson & Co., who was best known for losing billions of his clients' money to Bernie Madoff's Ponzi scheme when he ran the Fairfield Greenwich fund of funds, leaped to his death from the luxury Sofitel hotel in midtown Manhattan. Charles W. Murphy was wearing a dark business suit when he plunged to his death from the 24th floor of the 45 W. 44th St. building at around 4:42pm on Monday[3/27/2017]. The father-of-two financier, who was married to his second wife, plummeted 20 floors before hitting a fourth floor terrace, according to the NYPD, and died at the scene according to the Mail.